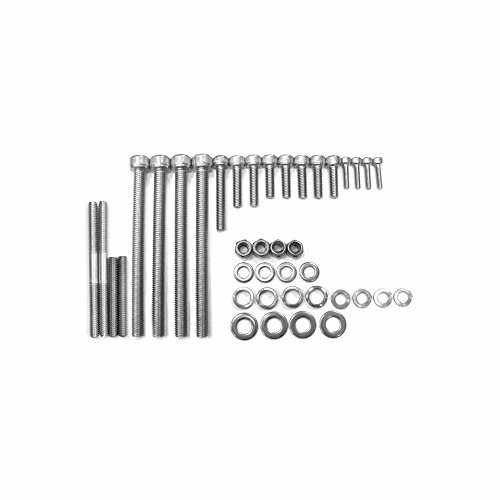 Stainless Steel Heavy Duty 49cc/66cc/80cc Engine Bolt Set All bolts are Stainless Steel Allen socket head bolts Specifications: 4 8mm X 1.25 X 100mm Bolts 1 6mm X 1 X 40mm Bolts 2 6mm X 1 X 24mm Bolts 5 6mm x 1 x 20mm Bolts 4 4mm X.70 X 15mm Bolts 4 8mm Washers 4 8mm Lock Washers 4 6mm Stainless Steel Nyloc Nuts 4 6mm Stainless Steel Washers 4 6mm Stainless Steel Lock Washers Weight: 8.4oz Note: we have no control over the engine design and there are many variations out there so not every piece of hardware may be compatible with your engine. Comparable With Most Engines Kits: Flying Horse, Mega Motors, Grubee, Stinger, Raw, ETC. Note: we have no control over the engine design and there are many variations out there so not every piece of hardware may be compatible with your engine.